A LINCOLN LOGS CLASSIC, JUST THE WAY YOU REMEMBER IT – Inspired by one of the original LINCOLN LOGS builds, the “Meeting House,” this 100th Anniversary Tin will evoke nostalgia in older generations and bring happiness to children. The manual offers three building ideas: a tall tower, two small houses with a bonfire, and a large cabin. Children can follow these guides or mix and match to build their own structures. 111 ALL-WOOD PIECES – The package includes 111 pieces made of real, high-quality maple wood. Each has indentations that can be used to connect it with others. Pieces are included for the roof, roof facade, walls, chimney, porch, fences, bonfire, and bonfire seats. COLORFUL DESIGN – These exquisitely crafted LINCOLN LOGS are beautifully stained, like a true cabin’s finish. Each piece is colored with precision and careful attention to detail to evoke the nostalgia of childhood. Most of the log blocks are stained bright brown. The face of the roof is a muted red, and the rooftops are forest-green. EASY AND QUICK CLEAN-UP – All the pieces can be stored in the set’s collectible tin. The features make clean-up easier, as parents can store it in one container, keeping living spaces and children’s playing areas tidy and organized. The covered tin can be stored after play time for safe keeping. 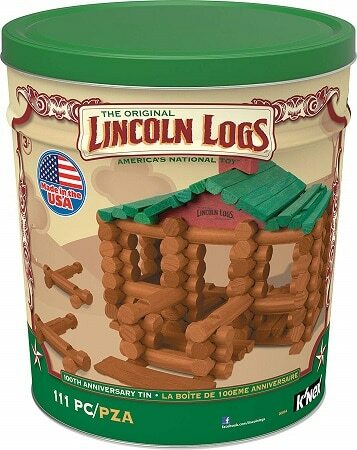 AMERICA’S NATIONAL TOY– Invented in 1916 by John Lloyd Wright, the son of architect Frank Lloyd Wright, LINCOLN LOGS have become America’s National Toy. Beloved by four generations of builders, they provide hours of fun while building a solid foundation in STEAM/STEM subjects.